I'm using Affinity Photo 1.5.2.69 on Windows 10. But where can I enable or disable "simulate paper color"? I can't find it. Not something I have much experience with, but as I understand it the idea is to select the profile that corresponds to your printer & paper. Yes sure. That's what option 1 is for. I've attached a screenshot from "a popular image editing software". On the bottom you can see two checkboxes. I'm looking for those. I assume that Affinity Photo is simulating paper color by default. I need to turn it off. Why would you assume that? How would AP even know which of the potentially dozens of different printer, ink, & paper combinations you intended to use for printed output? You can set default color profiles for each of the supported color formats in Preferences > Color Profiles, but that is only for files that do not have an embedded profile. I assume that because with the profile I need to use for a specific print, blacks get turned into grays. That's typical for paper simulation. They could know it by reading the information in the ICC profile. Which ICC profile would the app know to use unless you choose one in the soft proof adjustment layer? It may help to watch the Affinity Photo - Soft Proofing & Affinity Photo - Printing on Windows video tutorials. As I understand it, there is no default paper simulation unless you use a soft proof adjustment, explicitly select a document color profile from the Assign or Convert menu items, or (unusual) there is already one embedded in the file, and that profile is for a specific printer, ink, & paper combination. I agree with yout. There is no paper simulation during "normal work" outside of the soft proof. That would make no sense. Still: If the soft proof adjustment does add paper simulation, then I need to know how to turn it on and off. Sometimes I need it in the soft proof, sometimes I don't. Still: If the soft proof adjustment does add paper simulation, then I need to know how to turn it on and off. It is an adjustment layer so you can just toggle it on & off in the Layers panel. If you watch the suggested videos this should be a lot clearer. But I am curious, how do you set the paper colour ? I can't imagine how many different colours of paper there are that would need to be simulated. Yes I know. But this would also turn off the soft proof. Therefore makes no sense. If that is ture, then good to know. Thank you for a clear answer. You set it in the ICC profile. Other programs do it as well. This is no witchcraft. Maybe I just haven't been clear enough. All I wan to know is where to find the options marked in the screenshot below. And if Affinity Photo doesn't offer them, then I'd need to know if those are on or off by default. No you were clear and I answered you. It doesn't offer them so they are off by default. My question was, how do you set the individual paper colours. Not the option to simulate them. I am a former printer and know that there are thousands of different papers, shades, colours finishes etc, so how would you set a particular paper, like say Conqueror Vellum ? To be any good the option must go to a list of several thousand papers. My question was, how do you set the individual paper colours. You get that info from the ICC profile: Paper color via white point tag and black ink via black point tag. I'm not too sure on how they accommodate for colour. It's more about brightness. Anyway: You need to set up one ICC profile per every paper-printer combination you want to use. Yes, depending on how many papers and printers you are using, that will be a lot of profiles. But this doesn't fully answer your question: How to find out the correct black and white point tags and implement those into an ICC profile? I need to pass on that one. Fortunately, I only need to apply the profiles. I don't need to set them up. Device To Simulate Specifies the color profile of the device for which you want to create the proof. The usefulness of the chosen profile depends on how accurately it describes the device’s behavior. Often, custom profiles for specific paper and printer combinations create the most accurate soft proof. Simulate Paper Color Simulates the dingy white of real paper, according to the proof profile. Not all profiles support this option. So as I understand it, paper color simulation (if supported) is built into the color profile itself. If one of these custom profiles is used for soft proofing, soft proofing must be enabled to see anything it simulates on the monitor, including paper brightness or color, right? 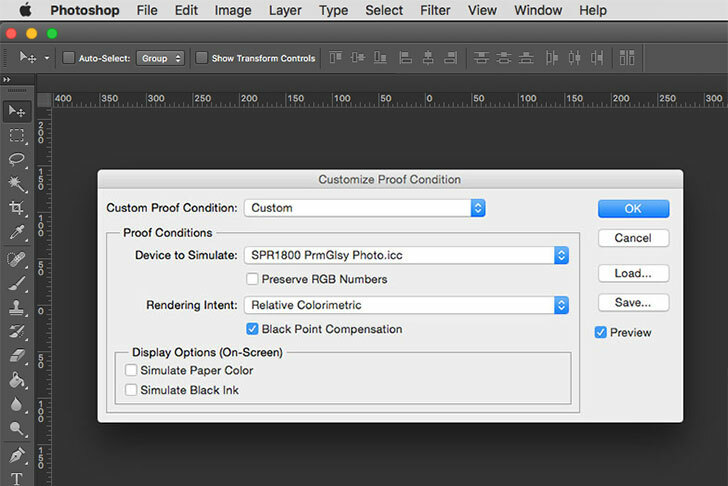 Photoshop includes a soft proofing option not to include paper color/brightness simulation, which Affinity Photo lacks, but that does not mean soft proofing in Affinity Photo does not include paper color/brightness simulation. So it is not really simulate paper "color" at all. It seems a bit daft to me. Paper varies so much, between brands, weight, gloss, silk, matt etc. how could they possibly know which one to simulate? Not all paper is "dingy". I guess I am too old school. I would always go for a proper proof. Actually, I suppose it would be possible to apply a soft proof layer then overlay a colour layer to simulate paper "dinginess" ? It seems a bit daft to me. Paper varies so much, between brands, weight, gloss, silk, matt etc. how could they possibly know which one to simulate? It is my understanding that these profiles usually come from paper companies like Red River, which maintains a large collection of ICC profiles for specific printer & paper combinations, like these for the Canon PRO-1000 printer. A web search on "paper color profiles" shows several paper companies that offer the same thing. They also can be created from hard proofs (actual printed output) using devices & techniques similar to those used to calibrate monitors. OK, I can understand that as ICC profiles, but am not sure if that is the same as simulate color paper ? What is your understanding of the word "color" when it comes to paper ? Thank god Serif name things more clearly. Well, apart from the "Rasterise" thing, and er um the "Gradient" tool, and the "Move" tool and the "View" tool. Yikes, they're all at it. My understanding is incomplete at best & possibly at least partially if not completely wrong, so please take that into account, but from what I have read from FAQ's & such from sites like Red River, it includes more than the brightness/dullness of the paper. Exactly what it does include, & specifically if it includes specialty colored papers, I do not know. The 'soft proof' for Affinity Photo gives very different results to the soft-proof of Photoshop. Particularly, the blacks seem to be at least gray with my printer-profile in the soft-proof, while Photoshop still displays a pretty-much-black. So both are set to 'relative' intent, and both with black-point-compensation, yet the result is clearly different. This is all on the same (Mac) machine, with the same display-profile loaded and with the same printer ICC profile. Particularly the out-of-gamut warnings which seem to be given waay to early make it impossible to do any real soft-proofing with Affinity Photo on my setup. I am also interested in 'Simulate Paper Color' feature. I have been using it all the time in Adobe Indesign to check how colour behaves on Yellowish oder uncoated paper. We should move this thread to the Feature Requests section.